A list of Free WordPress Themes that can be used to build your WordPress website to look like a Magazine, giving you the possibility to have a different layout for your homepage. I also included some Free WP Themes that can be used for giving your WordPress Blog that certain CMS like look. A recent free theme that came out on BlogOhBlog is called “Urbane” and it is free to use on your website. They have several other free themes that you can use for your site as well as really good looking premium themes. I used Urbane on a new site called The Porsche Classics and it has some great features like automatic thumbnailing for the front page without the need to use Custom Fields. Some time ago Brian Gardner and Friends released some of their WordPress Themes under GPL License instead of selling those Premium Templates. A few months later they changed the site so you need to purchase the theme download link… but you also get access to the tutorials for the theme you purchased. You can find this premium theme on the site of StudioPress. Update: Domain (aff) name and Theme Change on The Classic Porsche’s website. 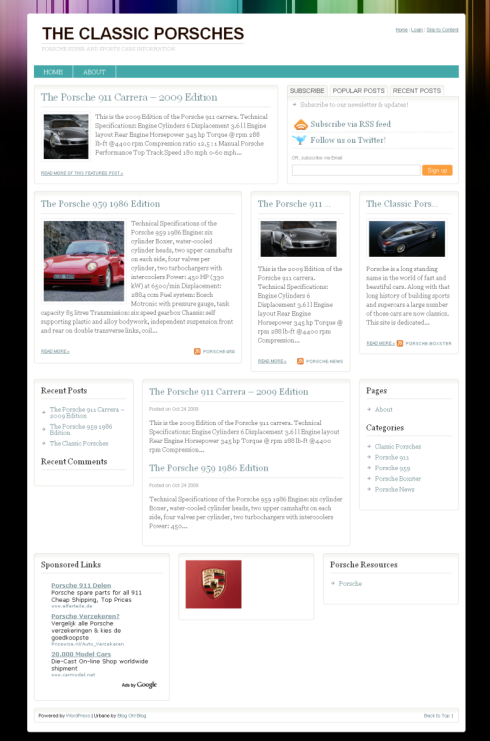 Because I wanted to clean out some of the many websites I have, I deced to consolidate the Classic Porsche’s website into Design-Cars.com. This older domain (aff) name and website need to come back strong in the search engines so I changed the theme to Metro Pro, a Premium Child theme of Genesis (aff) with very strong Design settings and very good SEO features. You can see the old layout above and check out the current one on the site itself.